Kathleen Rose Photography Blog: Colorado Wedding Photography | Jen + Sean Published on Rocky Mountain Bride! Colorado Wedding Photography | Jen + Sean Published on Rocky Mountain Bride! Always great to get fun news in your email! This wedding has really been an inspiration for a ton of brides - I am just glad I was a part of it! 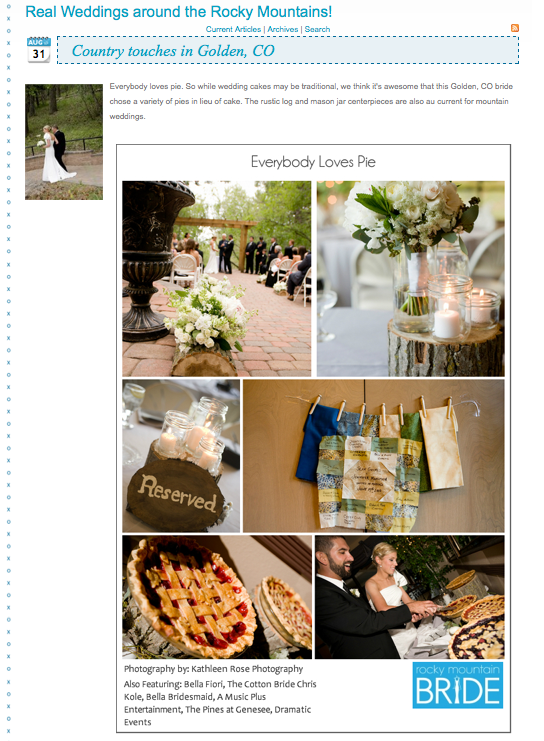 Click on the picture to go to Rocky Mountain Bride's online magazine! These wedding photographs took my heart away! The wedding venue is just splendid. I have been to such a gorgeous San Francisco wedding venues. Actually my cousin got married over there. I enjoyed a lot in his wedding. This is true Paul, you cannot capture your emotions with a camera. Also, there were so many times when spectacular views looked pretty lame on the cam. But then I realized that it's up to me to show the magic of the place with the help of online editing tools. I know you may think it's cheating, but I assume it's art. You can try it yourself actually, this is one of my favorite ones iphotoplugins.com.